Everything had gone according to plan. The Eye of the Beast---a cut, polished diamond the size of a hill giant's fist rests in your hands. It is worth 200,000 gold pieces! Obtaining the valuable gem comes at a cost, however, and soon you find yourself running for your life, hazarding the terrors of the night, braving sadistic guards, and slavering war hounds, wondering if there can ever be an ... Escape from Khosht. 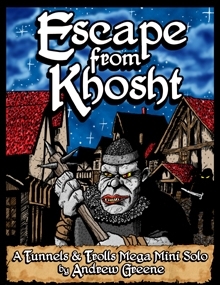 Escape from Khosht is a solitaire adventure written by Andrew Greene, and illustrated by J. Freels for the Tunnels and Trolls game system. The solo adventure comes with three pregenerated characters to choose from (a wizard, a rogue, and a warrior) as well as full stats and abilities for the two NPCs who journey with you, Radnoff and Chi-Chi.